In part one we looked at passing, in part two we looked at crossing. For the final instalment, we will look at what football is all about – goals. The only major surprise here is that the Premiership is so far ahead of the other four leagues – and this is an anomoly – the Premiership is seeing a bizarrely high number of goals this season, as detailed here. 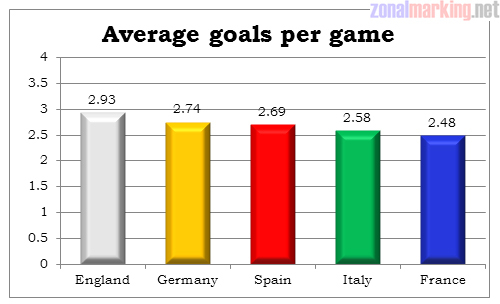 Indeed, the average goals per game over previous seasons is generally around 2.6 – pretty much average for the other four leagues listed. And there’s a decent correlation there, although nothing more than you would reasonably expect. 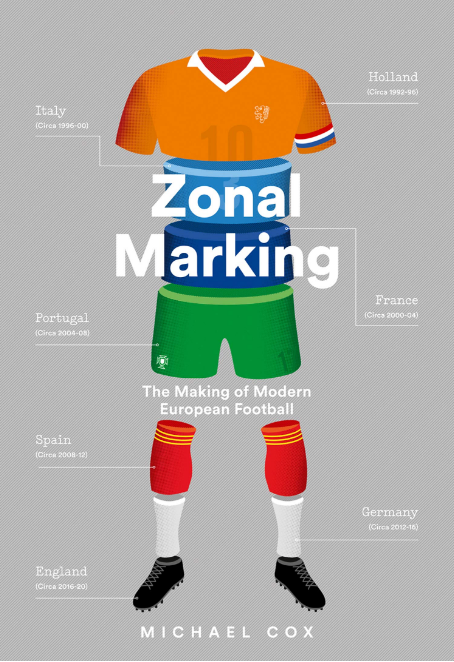 What explains Italy and Spain’s position to the right of the line of best fit? Better goalkeepers? More ‘on target, but not threatening’ shots? 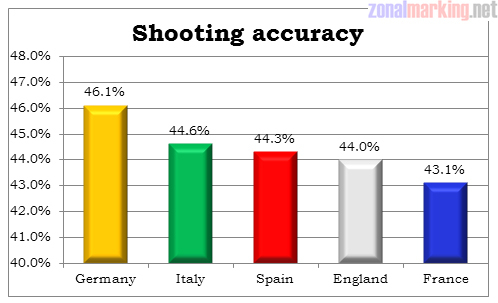 Using only five sets of data means the results here are highly unreliable, but we can vaguely come to the (perhaps inevitable) conclusion that the more shots you have on target, the more you’re likely to score. Look at that correlation! 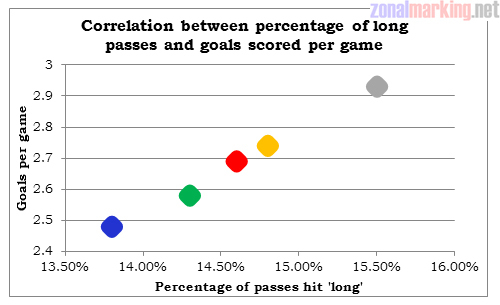 Granted, there may be only five figures to plot, but there is an undeniable link between the percentage of long passes, and the number of goals scored. But this, of course, is exactly the kind of analysis that led Charles Hughes to write the infamous The Winning Formula, which put forward the idea that the best way of scoring goals was to quickly get the ball into the ‘positions of maximum opportunity’ (ie, within shooting distance of the goal) – which ultimately resulted in the now much-maligned long ball game. 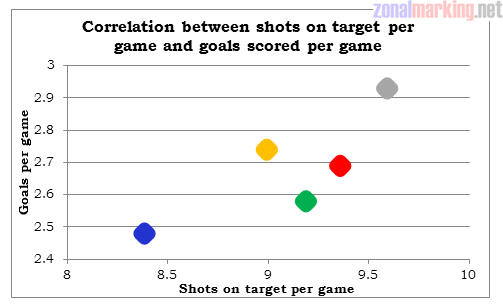 One should not, of course, see this graph and assume that the best way to score goals is to punt the ball long. That, in part, was the mistake many managers made having read Hughes’ work. Because this analysis is league-wide rather than looking at individual teams, the ‘goals scored’ figure increasing is not necessarily a positive thing for teams involved. Indeed, a single Premiership team, say, Sunderland, would not be any better off if the goals-per-game ratio in the Premiership suddenly rose to 4.5 – because they are just as likely to be conceding more goals as they are scoring them. Indeed, because a goal scored by one team is always conceded by another, it would be a classic zero-sum game. A more specific, rigorous statistical exercise within the Premiership would surely not yield similar, pro-long ball results. An educated guess would be that Arsenal hit the ball long less often than any other side – and yet they are the side who have scored (by far) the most goals in the league this season. This is not The Winning Formula. 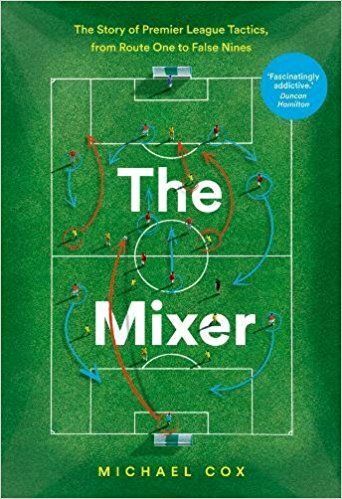 It is, however, an interesting insight into the vast differences between leagues, and prompts you to ask yourself what you’re looking for from football. Two things often held up as ‘ideals’ in football are (a) plenty of goals and (b) neat close passing. But these statistics insists that they are, at least on a league basis, inversely correlated. 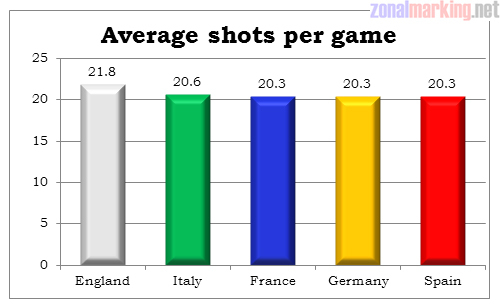 So what do you want: long balls and plenty of goals in England, or neat close passing but fewer in France or Italy? It would be interesting to look at long passes and goal differential to see if there is a correlation. By the way, this is an excellent blog. And Charles Reep before Hughes. I ‘tweeted’ to Gabrielle Marcotti that you must admire teams such as Aston Villa and the ilk’s urgency and forward thinking even if the football may suffer. And lo and behold there is some correlation although I doubt that correlation would exist as greatly against other European clubs. Culture clash. Excellent article as usual. Are you a member of the football365 forum? It doesn’t say that POMO prescribed playing long ball, merely that it “ultimately resulted in the now much-maligned long ball game” which was undeniably how it was interpreted by many managers. Cheers for the comment. Hopefully I articulated that Hughes’ analysis resulted in a belief that the long ball game was the way forward, rather than him specifically proposing playing long ball football. It seems to be a fairly common pattern that methods of how to play ‘efficient’ football (not necessarily defensive) is often poorly imitated by other managers, whose imitations end up being defensive. I think the same could be said of managers who copies Sacchi’s pressing game, or even of Premiership managers in 2004-06ish, who tried to recreate Mourinho’s 4-5-1 / 4-3-3 but ended up simply playing a 4-5-1 with a striker removed and a ball-winning midfielder in his place. Exactly. Look at Benitez’ attempt to play Saachi’s pressing game. Interestingly, Herrera was often critical of other sides’ attempts to play his version of Catenaccio, feeling that they missed the vital counter-attacking outlet of a Fachetti. Without that, it was just bog standard (although highly technical) defensive football. The correlation can be easily explained. If the difference between the two teams is large then we have a higher likelihood of a rout (which would push the average goals per game up) and a higher likelihood of the minnow punting long balls all day long hoping for a lucky break. A more equal match may feature less imbalances and so less goals and less long balls. Not sure you can say that. In Spain the gap between the top two and third is a massive 24 points. In England it’s only 10. Even the gap from top to bottom is only one point less in Spain (63) than it is in England (64) and yet there’s almost an extra goal scored every four games (0.24 extra goals per game). In Germany the gap between the top and fourth is only 9 points (suggesting a tight contest at the top) whereas in Italy the gap is 13 (which would suggest a bigger gap in quality between sides) and yet there are more goals per game in Germany. Even the gap between the top and bottom (43 points in Germany, 47 points in Italy) backs this up. In fact if you wanted to do a fourth in this series ZM, how about comparing leagues for “competitiveness” using the points tables? I’d love to see that, and see if the old stereotype that the Premiership is more competitive is actually true or a load of…you know. You might need to look at historical tables, though, not just one season. Otherwise, this was a really fascinating series of articles.